Northern Pacific Railway 1074, “dead line” Stacey Street Yard, Seattle, July 1958. It’s hard to imagine that this photograph is 50 years old! I was a mere lad of 15 when the family drove from Prince Rupert to Seattle for a vacation. One of my buddies took me around to the various Seattle hot spots – Interbay, Argo, Van Asselt, Black River Junction, Auburn, and, of course, Stacey Street. As in BC, the winds of change were everywhere. Out behind Sears-Roebuck, we discovered a sad sight – a long line of Northern Pacific steam with cold boilers, awaiting their fate at the hands of the burners. 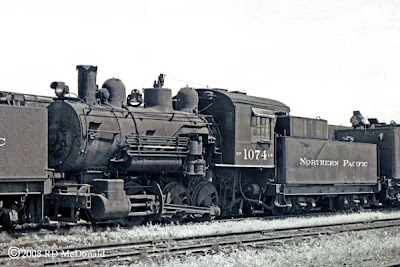 Northern Pacific 1074 was one of 10 engines delivered to Northern Pacific in 1907, NP 1065 – 1074. The building of the Northern Pacific Railway into Seattle – Tacoma makes for interesting reading: “The Northern Pacific came to the realization that Tacoma could not supplant Seattle as the dominant city in Puget Sound, no matter what the railroad company did. James McNaught, a Northern Pacific agent based in Seattle, stated "It is a fact that one car of freight is brought to stay at Tacoma, where ten cars go to Seattle." Railroad stuff: Northern Pacific 1074, Whyte 0-6-0, built by American Locomotive Works (Manchester) in 1907. Ten locomotives in this class, L-9, featuring Stevenson valve gear. 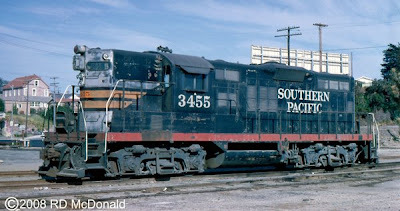 Southern Pacific 3455, GP9, McMinnville, Oregon, June 1966. 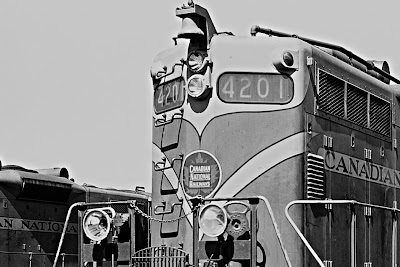 It has been said that no other railroad in recorded history carried such an array of locomotive headlamps than the Southern Pacific! Sporting her Ben Dedek inspired “black widow” paint job, we look closely at the lamp array on this GP9. From top to bottom – single red oscillating lamp, dual sealed beam headlamps, and dual oscillating headlamps and a bullet classification lamp off to the side. 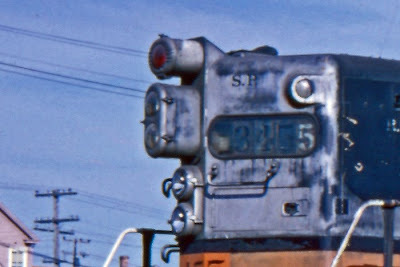 A variation substituted the “beer barrel” light in place of a dual seal beamed luminary - shown here on SD9 5354. Oscillating luminaries had two common patterns; the figure “8” or the “0” oval pattern, each designed to catch the attention of motorists, and separate the locomotive, often moving at considerable speed, from “background” lights, especially at night. I understand that a "W" pattern oscillating lamp was briefly available. 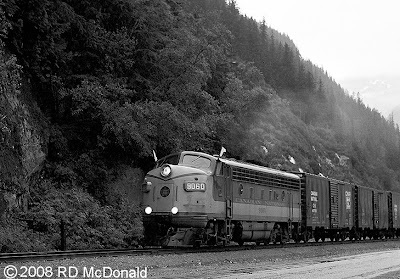 So called “ditch lights” showed up on diesel electrics while we lived up in Prince Rupert in 1957 – 1959. They were not a factory option from GMD. 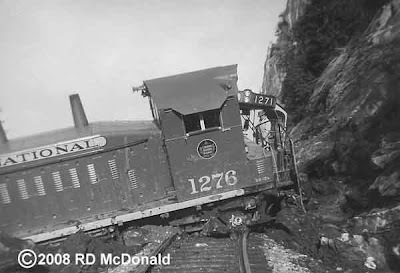 They were, in fact, an attempt by train crews to give them a fighting chance against the dangers of rock falls; mud slides, downed trees, and undercut roadbeds, which plagued the rugged mountains and canyons of British Columbia. The beams were optimized to give train crews a look-see around curves. But even with this lighting system, crews still came to grief, and still do to this day! This accident occurred in a permanent slow order – 15 mph – stretch of track! According to a newspaper interview with the engineer, ground fog off the Skeena River obscured the offending rock pile! Once upon a time, another type of lamp shone brightly from the front of the locomotive; the so-called “classification” lights, augmented with similar colored flags. 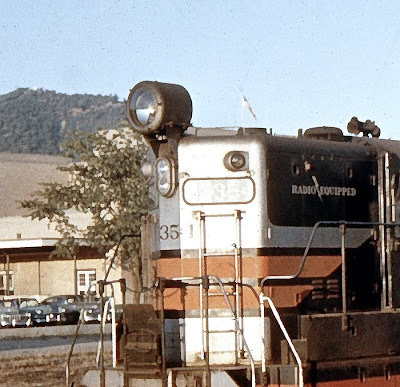 Although the CNR 9060 has a burned out classification lamp on the fireman's side, they are operating during daylight hours, and only 45 miles from home - running under the protection of the white flags. 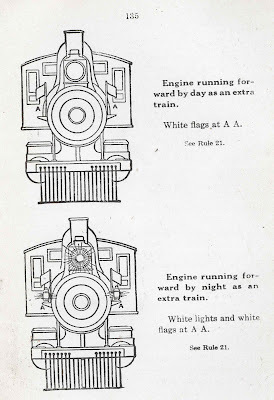 From the 1909 Grand Trunk Railway Operating Rules, we find this explanation of the white classification lamp and white flag. This announces the fact that this train is operating “off the timetable.” It is an extra, whose movement is governed by the dispatcher. 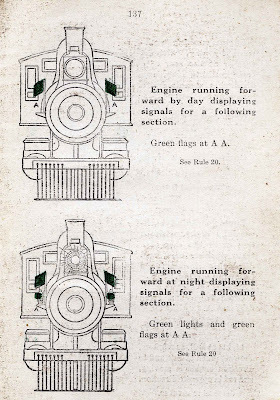 Green flags and lamps indicate additional or “second” or more sections of the original proceeding train, time tabled or extra. And the red indicator signaled the rear of a movement or helper engine. Or in this example, Santa Clause coming to town! 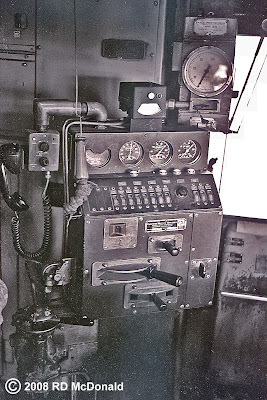 With the advent of Centralized Train Control and other operational systems, the classification lamps have gone the way of the train orders or flimsies, and an era when train crews had to really understand their movement across their subdivisions is history! Great Northern Railroad 712, Interbay Yard, Seattle, July 9, 1960. It was always a great treat to drive up to Interbay – there were such a variety of power units awaiting assignments. And if you’ve been a regular reader of this blog, I’ve remarked before on dispatch not hesitating to pick "one from column A, one from column B and one from column C” when assembling a power pack, resulting in some interesting lash-ups! This summer is the last summer of “hanging out at the rail yards”– as I prepare for my senior year in high school. Even at that, I was working a darn good paying job at Bethlehem Steel. "Give me snuff, whiskey and Swedes, and I will build a railroad to hell!" This rather colorful promise attributed to James J. Hill, builder of the Great Northern Railroad. An interesting character born and raised in Ontario, he adopted the US for his grand adventure, completing the 1,700 miles from St. Paul to Seattle in January 1893. 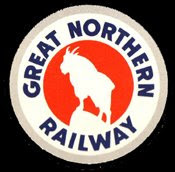 The key to the Great Northern line was Hill's use of the previously unmapped Marias Pass. The pass had been discovered by John Frank Stevens, principal engineer of the Great Northern Railway, in December of 1889, and offered an easier route across the Rockies than that taken by the Northern Pacific. GN 712 was no sooner spotted when I climbed aboard and got a neat shot of her control stand. I wonder if railfans have such easy access in this day and age? Rail Road Stuff: Great Northern 712, built by Electro Motive Division, La Grange, as a GP-9, 1,750 hp, April 1957. Serial Number 22480. Suffered the Big Sky Blue treatment following the Big Merger. Sentenced to expire at General Metals, Tacoma, June 1986. Pacific Great Eastern 51, 2-8-0. Gotta love these builders’ photos. It is obvious that someone, perhaps a lowly apprentice, spent hours carefully eliminating all background distractions – not only around the outside edges of the locomotive, but also beneath, leaving only the finished product for catalogs and other promotional materials. Here’s a shot of PGE 51 at work, taken in Quesnel in the 1940’s. This site also has a worthy collection of photos for you to browse. 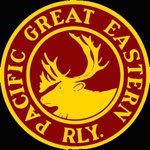 Railroad Stuff: Pacific Great Eastern #51, 2-8-0 Consolidation. Need your help on this one! 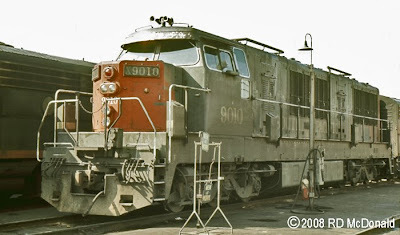 Southern Pacific 9010, Oakland Yard, 1964. 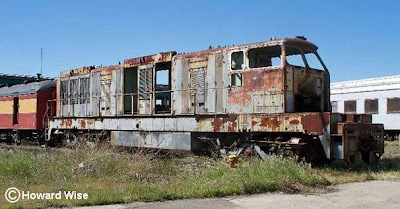 I am amazed at the amount of "questionable" information floating around on the internet concerning certain locomotives. While we all strive for accuracy, it does take some time to verify your sources, as I was taught as a radio newsman back in the late '60's, by up to three individual sources. Following the "Original" orders by Espee and DRGW of three units each, an additional order of fifteen units was placed by Espee in 1963, 9003 through 9017. These units were renumbered in the massive re-numbering scheme of 1965 to 9106 through 9120. 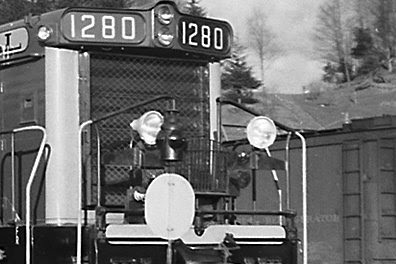 SP 9010 was the original number in the 1963 order. It was re-numbered 9113 in 1965. 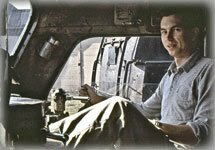 And following being "vacated" in 1967, was rebuilt as camera car SP8799, used to create films for use in simulator training. Is my "analysis" correct? Open to your comments! Howard Wise writes, there are two road numbers missing - SPWM 1 and SPMW 1166, then SP 8799! Gads! Here's what she looked like in her final hours - what a sad scene! Thanks to Howard for the info and the photo! Promontory Point Utah, site of the “Last Spike” ceremony, June 1976. We’ve taken a few weeks off to do some traveling, and looking at the route between Idaho and Salt Lake City, we decided to include Promontory Point in our itinerary. Promontory Point is a destination, not just an off ramp on the freeway; a minor journey out into the middle of no-where! But we did luck out, in that this being the Centennial Year, functional replica locomotives, Union Pacific #119, a coal burning 4-4-0 on the left, and Central Pacific #60 the “Jupiter” a wood burning 4-4-0 on the right, had been placed for significant reenactments of that memorable day – May 10th 1869, when east joined west. So here we have on the left, representing the Union Pacific Rail Road, #119. She was a coal burning locomotive, designed to utilize rich coal reserves located in Western Wyoming. 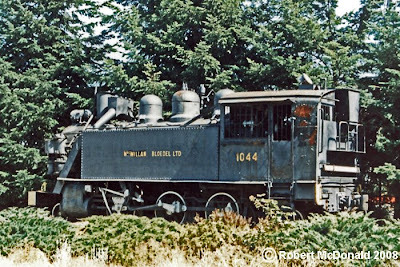 One of five locomotives, 116-120, ordered from Rogers Locomotive and Machine Works of Paterson, New Jersey. She was completed in November 1868. This information was extracted from an entirely engrossing paper entitled “Union Pacific Locomotive #119 and Central Pacific Locomotive #60 the “Jupiter” at Promontery Summit, Utah, May 10, 1869” by Roy E. Appleman. West Evans, tie contractor for Central Pacific, had San Francisco billiard table manufacturer Strahle & Hughes prepare a highly polished tie made from California laurel wood. The 7 1/2 foot long, 8 X 6 inch tie bore a centered silver plaque marked, "The last tie laid on completion of the Pacific Railroad, May, 1869." the plaque also listed the officers and directors of Central Pacific along with the names of the tie maker and donor. Four holes were augured, or drilled, into the tie in order to accommodate ceremonial spikes without the need to drive them. Before the start of the Golden Spike Ceremony, workers brought the laurel wood tie from Stanford's coach, placed it down, and laid the last rail sections across it. The Ceremony commenced, emceed by wealthy Sacramento banker Edgar Mills. The Reverend Dr. John Todd of Pittsfield, Massachusetts, offered the invocation. Presentation of the spikes and ties followed. After an arduously verbose speech, Dr. H. W. Harkness, a Sacramento newspaper publisher and editor, presented the two golden spikes to Leland Stanford, who placed them into the first and fourth pre-drilled holes in the laurel wood tie. Governor Safford presented Union Pacific Vice-President Thomas Durant Nevada’s silver spike by Mr. Tritle and Arizona’s spike. Durant placed these spikes into the second and third holes in the tie. Stanford then offered a rousing speech. He was to have been followed by Durant, but, due to Durant's severe headache (most likely a hangover from the previous night's party in Ogden), Union Pacific's Chief Engineer, General Grenville Dodge, took Durant's place and gave a few short, yet enthusiastic words. Mr. Coe then presented the silver plated maul, which Stanford and Durant used to ever so gently tap the precious metal spikes, leaving no mark upon either the spikes, or the maul. Immediately, the precious metal spikes and laurel wood tie were removed and replaced with a pine tie, into which three ordinary iron spikes were then driven. A fourth iron spike, and a regular iron spike hammer, were both wired to the Transcontinental Telegraph line so that the Nation could "hear" the blows as the spike was driven. Being a man of large stature, Stanford took a mighty swing at the spike, and struck the tie instead. Durant, still not feeling too well, took a feeble swing, and did not even hit the tie! Finally, a regular rail worker drove home the last spike, and the telegrapher, W. N. Shilling of Western Union, sent the long awaited message, "D-O-N-E." The time; 12:47 P.M., Monday, May 10, 1869. After the Ceremony, the Golden Spike traveled back to California in the laurel wood tie aboard Stanford's coach. En route, a group of Army Officers riding with Stanford attempted to "drive" the Spike into the tie with the pommels of their swords, which accounts for indentations on the Spike's head, its only mar. Following a brief time on display, the Spike was returned to David Hewes. Hewes kept it until 1892, when he donated his extensive rare art collection, including the Golden Spike, to the museum of newly built Leland Stanford Junior University, Palo Alto, California. Nevada's silver spike was temporarily returned to Virginia City jewelers Nye & Co., who brightly polished the spike and engraved one side, "To Leland Stanford President of the Central Pacific Railroad. To the iron of the East and the gold of the West Nevada adds her link of silver to span the continent and wed the oceans." The spike was then delivered to Stanford and eventually placed along with the Golden Spike in the Stanford University museum. It is unknown what happened to Arizona Territory's spike immediately following the Ceremony. Decades later, it became part of the Smithsonian's transportation museum, then went to the Omaha, Nebraska Union Pacific Museum and today is at the New York Metropolitan Museum in New York City. The whereabouts of the second gold spike is unknown. It has been speculated that the spike was given to one of the Union Pacific dignitaries, but there is no mention of the spike in any of their memoirs. It is also possible that the spike was returned to the News Letter. If so, its fate may well have been the same as the newspaper company, when, in 1906, the San Francisco earthquake and fire destroyed the News Letter Building. The silver plated spike maul was also given to Leland Stanford and became part of the collection at Stanford University museum. The famous laurel wood tie remained on display in Sacramento until 1890. 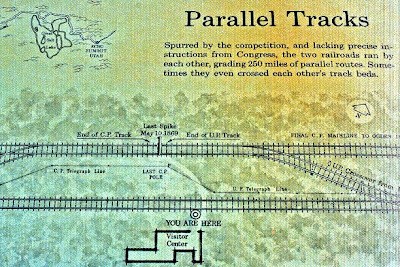 By then, Central Pacific had been reorganized into Southern Pacific, and the tie was taken to the railroad's San Francisco offices in the Flood Building. Unfortunately, the building and tie also fell victim to the great earthquake and fire of 1906. 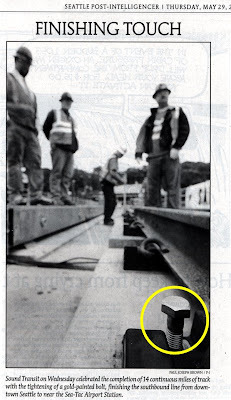 The recently “driven” last spike marking completion of Seattle’s Sound Transit's extension toward Sea-Tac airport, was not a golden spike driven into a laurel wood tie, but a gold painted bolt holding a rail retainer clip. I guess a solid gold bolt would be too expensive to make and guard, and gold plating – well, let's just go with the gold painted bolt! Canadian National Railroad, Yale Subdivision, November 1959. The blog has been "off the air" these past weeks as a result of a major derailment in my life. I was struck down by a big time heart attack on June 11, ironically as I was in my “Exercise for Health Program” at Jefferson Hospital here in Port Townsend. Apparently I was air evacuated to Harrison Hospital in Bremerton, some 50 miles south of here. But believe me when I say I don’t recall the flight. In fact I was out like a light for two weeks on a respirator. Then moved to a recovery center here in Port Townsend, and home today. Since the theme tonight is derailments, let me share with you the latest update from Ms. Zoe Richmond, Union Pacific, on Coyote Mountain / Frazier slide, which shut down the Natron Cutoff for months. Now there are some older items that I’ve previously posted on this update, but there is a new addition to the page, featuring a slide show. Slow the slides down to appreciate the magnitude of the repair and slope stabilization, incorporating an astounding 700,000 tons of rock. Now our focus moves north across the border to the absolutely magnificent Thompson River Canyon, just north of Lytton, where a rockslide dropped down onto a south bound Canadian Pacific freighter. We are not talking about a lazy flowing river; in fact the water flow is hitting its peak, as the Thompson heads toward its confluence with an equally fantastic Fraser River. 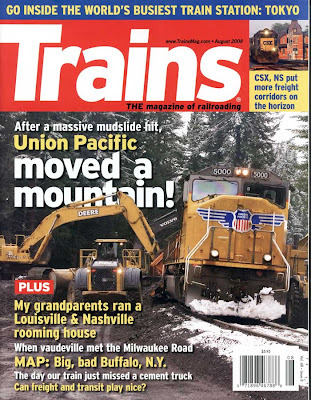 I encourage you to read these articles to appreciate what the railroad is contending with. The work of a diving team risked life and limb to enter the rushing waters to inspect the downed cars. They measured the few holes they found in the double skinned tanks, and drove in custom designed hard wood plugs, based on their findings. Next, rock bolts were driven into the canyon wall, and steel cables attached to the cars, to await the summer drop in water levels. 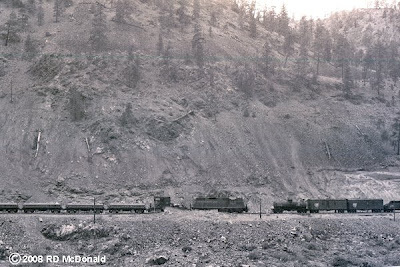 Both the Thompson and Frazer River Canyons has been the scene of dozens of wrecks and derailments. Be sure to read this first-person account of what is is like to survive a derailment, accompanied by a beautiful set of photos that exemplify both the beauty and danger train crews routinely face every trip! This wreck was on the Canadian National right of way. 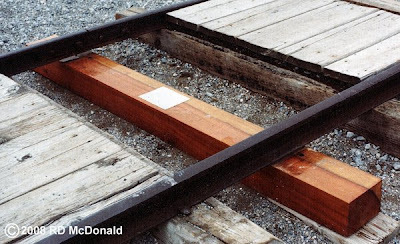 This demonstrates why crews preferred long nose first, not only on the Canadian Pacific, but also the Canadian National and Pacific Great Eastern, operating the wilderness of British Columbia! In the top photo, taken in the Yale Sub in 1959, look carefully, and you can see the upper break away edges of the rock slide. CNR GP-9 4217 is working a ballast train, during the final stagtes of clean up.